Senior Derek Laferriere looks to shed a tackler during Truckee's 63-0 win over Brete Harte on Friday, Aug. 24. 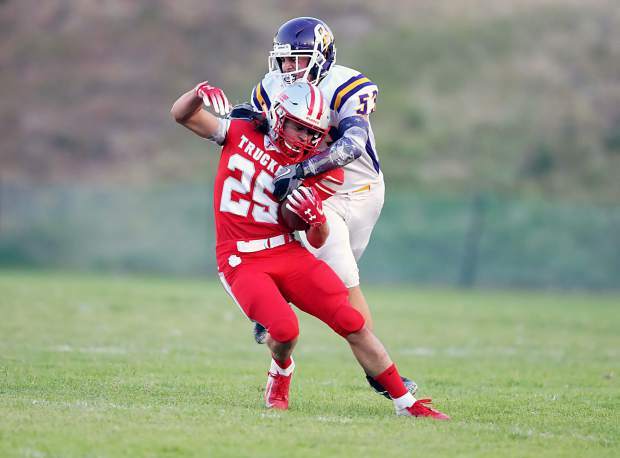 Truckee football will put its 2-0 record on the line Friday night when the Wolverines jump back into league play with a road game against North Valleys. After struggling for years against northern Nevada’s larger schools at the Class 4A level, North Valleys opened its inaugural season at the 3A level last week with a 50-14 blowout win against Dayton. The Nevada Interscholastic Activities Association approved North Valley’s request to move down to Class 3A in all sports, as the school looks to become more competitive in athletics — a move that has been met with some resistance by programs at the level. Dayton sent a contingent of school administrators to the association’s meeting last June, but had its request to drop down to 2A denied. Wooster, which has struggled on the gridiron the past several seasons at the 3A level, had to return to Class 4A this season. After drubbing Dayton to open the year, the Panthers will get a true test at the Class 3A level when they face Truckee Friday night. The Wolverines are off to a hot start this year with decisive wins over league rival Fernley and nonleague foe Bret Harte. Most recently, the Wolverines steamrolled Bret Harte, 63-0, behind contributions from all sides of the ball. The offense often took advantage of good field position, special teams put points on the board and blocked a punt, while the defense pitched a shutout. By halftime, Truckee had blown the game wide open, leading 49-0 and allowing for Ivens to mix in his bench. The Wolverines will see a stiffer test this week against the Panthers. Offensively, North Valleys often operates out of the shotgun formation, with senior quarterback Kyle Claiborne and running back Garrett Pennington shouldering most of the load. Claiborne was effective against Dayton with three touchdowns and 214 yards. He did, however, struggle with accuracy, completing 37.5 percent of his passes, which could bode well for Truckee and its overall defensive speed. Claiborne was also the team’s leading rusher with 135 yards on nine carries and three touchdowns. The game is scheduled for 7 p.m. on Friday at North Valleys High School.